Henry Albert Hockey, known as Harry, was born in Yeovil in the summer of 1894. He was the son of train stoker Henry Hockey (b1875, Yeovil) and his wife Mary Hannah (b1871, Chard). They had four children - all born in Yeovil - although one died in infancy; Harry, Agnes May (b1900) and Ivy Florence (b1905). In the 1901 census the family were listed living at 6 North Terrace, Newtown. Henry gave his occupation as a railway engine stoker. In the 1911 census the family were living at 14 Victoria Avenue, Chard. 16-year old Harry gave his occupation as an engineer's clerk at Phoenix Engineering, Chard. Henry and Margaret, with their family, later moved to Pen Field, Sherborne Road. Harry enlisted at Yeovil on 11 April 1918, joining 'B' Company, 32nd Battalion, Machine Gun Corps (Infantry). His Service Number was 171526. During the summer of 1918, at Chard, Harry married Ida Sophie Hutchings of Wadeford, Chard. On 9 October 1918 Harry was drafted to France with his unit. Sadly, just one month later, Harry was killed by the explosion of a mine on 9 November 1918 - just two days before the Armistice. He was 24 years old. 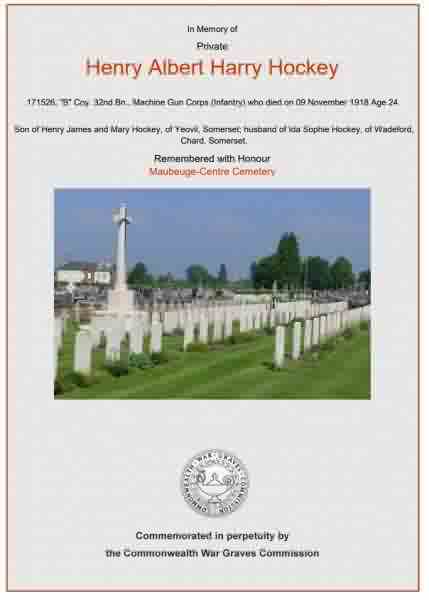 Henry Albert 'Harry' Hockey is interred in Maubeuge-Centre Cemetery, Nord, France - Grave D62. The inscription on Harrys' headstone reads "Beloved husband of Ida S. Hockey in dear memory ' Until the day break' ". Harry's name is recorded on the War Memorial in the Borough. The Commonwealth War Graves Commission certificate in memory of Henry Albert 'Harry' Hockey.